There are times that I’d like to tell you exactly what I think of a cake but I don’t because I’m afraid the bride may read it and get her feelings hurt. You never know who is reading these blogs! 🙂 In my experience your final cake design is usually a combination of the brides taste and your style as a decorator. Sometimes it’s just someone else’s design with some minor changes. That’s the case here. I really like the original design, don’t get me wrong. I wish I knew who did it because they deserve some major credit. 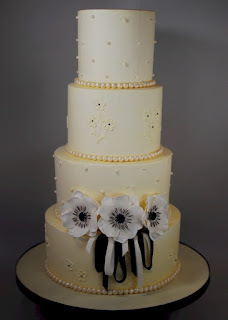 What I don’t like about this cake is the cream color and stark white contrasting flowers. It was much prettier in the original design where it was all white. The base icing is the way my main icing comes out naturally. My “house” buttercream is a French buttercream and is made with whole eggs and butter that color the icing this light yellow color. When I first started making cakes, I thought I just had to deal with the color and most brides were fine with it because they did not want a Crisco icing. I’ve learned in the past few years to add a few drops of violet and it cancels out a lot of the yellow cast. Don’t ask me how, it’s just magic! I then add some white food coloring to the outer coats of icing. It gives the cakes a much whiter finish. I really dislike the yellow color now so maybe that’s why I wasn’t super happy with the final cake. The design itself is super easy. I used a basic five petal gumpaste cutter to mark the flower outline all over the cake. If I freehand something like this, I start with one size and when I get back around the cake it’s totally different. I used a #3 tip a piped the flowers a couple at a time since the cake was cold. You don’t want them firming up before you have a chance to take the brush to it. You just take your brush and pull it inward. Easy squeezy! Of course the anemone flowers could have been easier, but I made it harder. I made all the pieces ahead of time, but didn’t put two layers of petals together until the night before the event. They would not fit because they dried in different shapes. Luckily, I just had to recut the back set of petals. I also tried something with embroidery thread for the middles of the flowers but they looked like a fuzzy mess, so I went a different route. You should make your gumpaste flowers on the Monday before the wedding or earlier. You need to paint them way early to because you often break a few and they can get ruined with a bad paint job and you have to start over. Plan for the worst and hope for the best! When it’s all done and I look back at a cake that I wish would have been different, I remember that the bride was happy and that was the ultimate goal.